Is This A Magic Dress, Or…? We haven’t seen anything like what’s going on with our new Coastline Cover Up Dress. We’ve talked to a LOT of people about this. 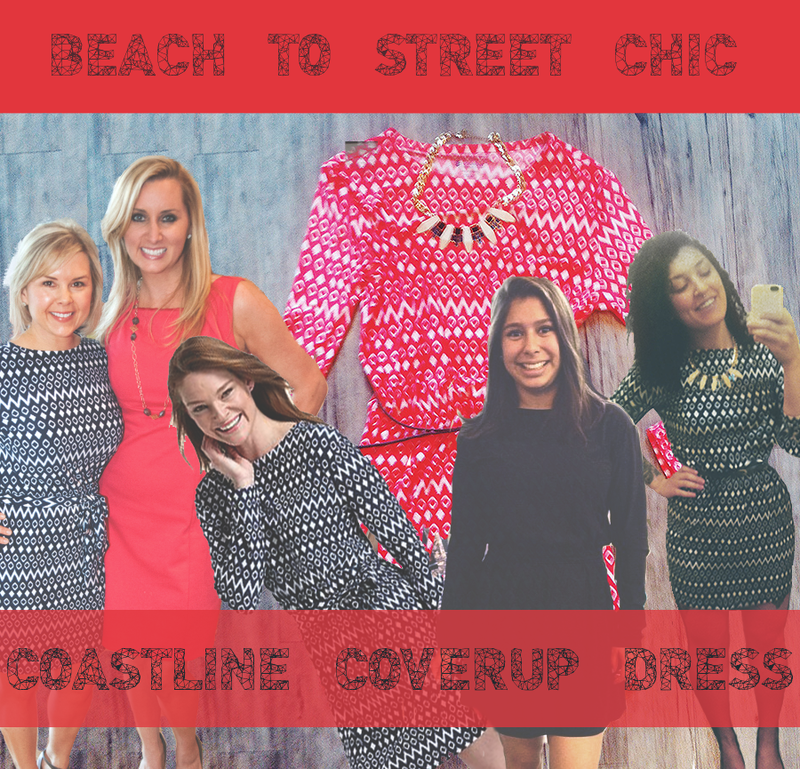 And most have told us that when they saw the Coastline Cover Up Dress in our catalog or online, they didn’t even notice it at first. They think it looks okay on the model. But when they put it on themselves – BOOM. They love it. We don’t know anyone who owns the Coastline Cover Up Dress that doesn’t love it. Everyday girls love it. Bloggers love it, too. We can only say it’s a magical dress. We suspect we might be the first clothing company, sun protective or not, ever to create a dress like this. But we don’t know for sure. There’s a certain magic behind Coolibar products for Spring 2014. And, while UPF 50+ sun protection provides its own technical wonders, this magic has much more to do with color – bright, positive, life-in-the-sun kind of color – and patterns that accentuate both what we do and how you feel. 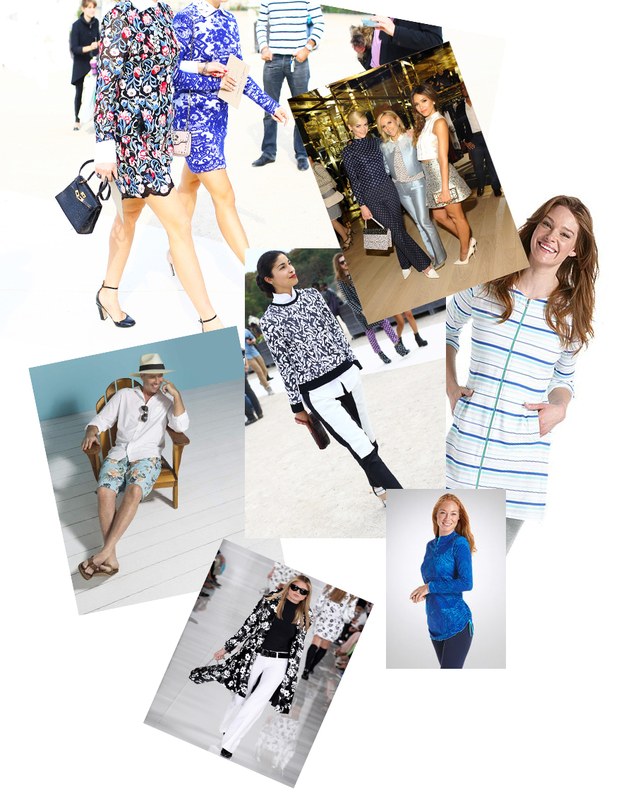 To start: the color blue is officially “in” for spring. So are ranges of mints and corals, along with striking prints that call to mind soft, light, watery brushstrokes that reflect the unique design personality of Coolibar. 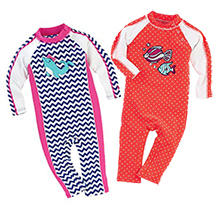 You can see these choices in our spring 2014 catalog. But they originate from the runways of fashion meccas worldwide, and from renowned authorities on color such as the Pantone Color Institute®. Pantone includes some of the same shades in its semi-annual report of the latest in fashion. This report is generated in part through a survey of New York Fashion Week designers. Of all the new Coolibar spring colors and patterns, blue takes precedence. Blue is “in” at Coolibar because it suggests tranquility, the calm of a pool and the gentle ocean tides. Water is part of the joy of life in the sun, and it’s a big part of Coolibar; it’s also, naturally, most of what we are as human beings. You’ll see blue represented in spring fashion shows worldwide, and you’ll see shades from deep navy and cobalt blues to azure turquoise throughout the Coolibar spring line. Mint and coral – also prominent spring color worldwide – are variously bold (e.g. Coral Heather) and complementary (e.g. Mint Deco) and extend the overall water-based Coolibar identity. In fact, the new spring prints – bold ikats, striking tribals and more simplified geos – are all reflections on the motion of water. Topping off what’s “in” for spring is a nice dash of black and white. By themselves, each color has a timeless quality; along with the blues, corals and mints and other Coolibar colors, they complete ensembles that are truly stunning. Shop Coolibar online to find out more about our spring 2014 selection. New products are arriving daily! Coolibar is already thinking spring: warmer temperatures, more active lives and all that goes with them. This spring, we’re also thinking about staying cool when the weather heats up. Which brings us to CooltectTM. What is it? Unlike other names you may have seen as part of our SUNTECT® fabrics, such as ZnO, aqua plus, 3D dri or lite, Cooltect is not a fabric. Instead, it’s an innovative cooling technology that Coolibar adds to the sun protective fabrics in selected items. You can usually tell if your Coolibar item has Cooltect by looking on the inside lining. 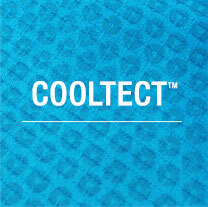 You can probably feel it, too; Cooltect actually holds the garment slightly away from the skin, creating extra airflow. But Cooltect doesn’t really start working until you do. Think about the instant cooling sensation when you start chewing a piece of mint gum. Just as the gum reacts to saliva, the technology within the fibers of the Coolibar garment reacts as your body begins to perspire. This activates a cooling sensation and helps lower the surface temperature of your skin. This cool, comfortable sensation has already impressed some well-known Coolibar athletes; check out their reviews here and here. Remember, Cooltect doesn’t replace any of the Coolibar features that provide UPF 50+ sun protection. 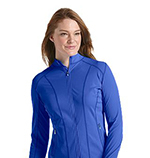 You get fitness gear that protects AND keeps you cooler during warm weather activity. Coolibar offers Cooltect cooling technology on select UPF 50+ products suited for fitness activities. They include our Long Sleeve Cool Fitness Shirt for women, Long Sleeve Cool Fitness Shirt for men, Short Sleeve Cool Fitness Shirt for women, Short Sleeve Cool Fitness Shirt for men and the Quarter Zip Long Sleeve Fitness Pullover for women. Watch for the latest Coolibar products featuring Cooltect in our spring catalog! Excitement for Spring: Check Out the Fashion Trends Behind Coolibar’s 2014 Spring Line! We are knee deep in snow here in Minnesota, and like so many other places this year we eagerly anticipate the arrival of spring! Along with the warmer temperatures, we can’t wait to see all of you showing off the latest spring and summer fashions for 2014. Around the world, eye-popping new trends have been making their way down the runway and into Coolibar’s spring collection. Our design director Olga Mashkova has been planning and implementing this year’s great looks. The new 2014 UPF 50+ spring line will perk up your look – for men, women and kids – with fun pops of pattern and color. We are especially excited about new geometric and ikat prints, along with beautiful pallets of blue. At Coolibar, we put fashion into action by integrating the most up to date looks with the skin protection required to keep you and your family safe in the sun. Check out the fresh new lineup for spring, available now at Coolibar! Here’s a look behind the scenes during the Coolibar spring 2014 photo shoot – and a quick sneak peek at our new UPF 50+ sunwear. Look for our spring catalog, with the newest sun protective shirts, hats, skirts, swimwear and much more, in your mailbox starting January 20. (Note: your Coolibar spring catalog may arrive anytime within an eight-week time frame). 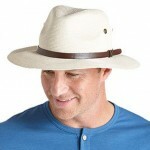 Shop www.coolibar.com starting January 20th for new Coolibar sun protective products for men, women and kids! We love a guy with something to say, especially when he’s reviewing our products. 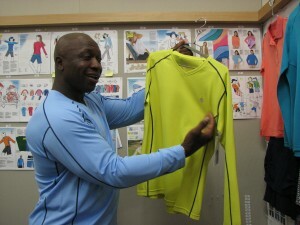 Randle has tested almost every athletic shirt on the market and knows a thing or two about workout wear. Because he’s already a fan of our first generation Fitness Shirt we couldn’t wait to get his opinion on our update to the 3D dri SUNTECT® fabric used in our fitness shirts, we’ve added a new cooling feature called COOLTECT™. Our Short and Long Sleeve Cool Fitness Shirts incorporate moisture activated cooling particles that lower skin temperature in addition to a quick dry mesh side panel for improved air flow making the shirts feel ultra cool and lightweight. 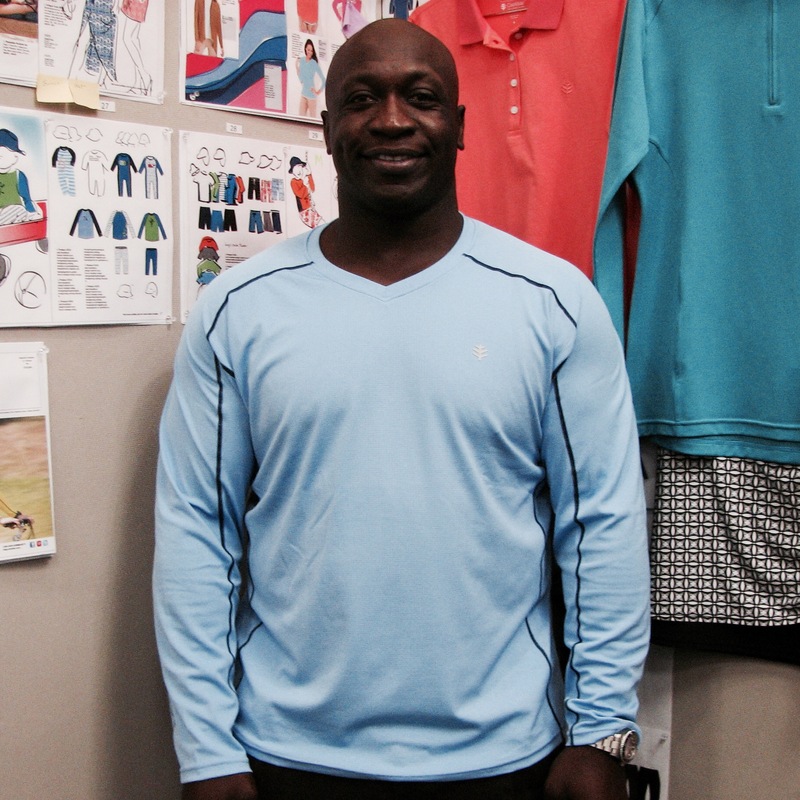 Randle, a fitness fanatic, works out 6 days a week – running, walking & resistance training. He had plenty of opportunities to test our Cool Fitness Shirt. Below is our Q&A session. 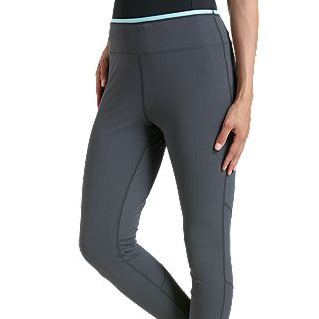 Coolibar: What’s the most important feature you look for in the fitness clothes you choose to wear? JR: Comfort, durability, longevity and style – it has to look good! Coolibar: What are your overall thoughts on our Cool Fitness Shirt? JR: It works great! 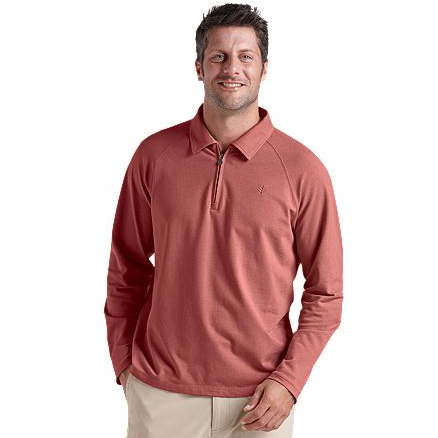 The shirt is comfortable, wicks sweat, washes well and looks good, unlike some competitors. Each time I wash it, it Looks Fresh. My body felt cooler and I could concentrate on my workout. Coolibar: How well did the cooling dots perform? JR: They worked, I felt cooler, while my body heated up. 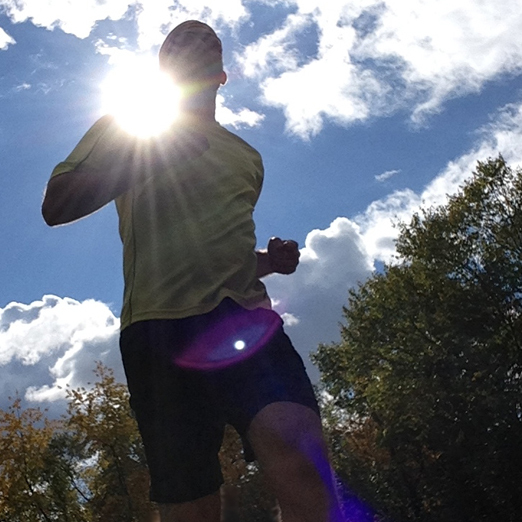 It felt like a cool breeze was coming over me, or like I was running near a vent. I looked and there wasn’t a vent near me. Coolibar: Did the fabric meet your expectations? JR: YES! It’s comfortable, breathable and cool. It’s not just a workout shirt, I wear it on the weekends and sometimes even sleep in it too, it’s that comfortable. Coolibar: Did the fabric stick to your skin? JR: No, it’s light & breathable. I loved your fitness fabric before, but the new one is even better. It feels so much lighter. Coolibar: What score would you give our Cool Fitness Shirt on comfort, scale of 1-10? JR: 10, I Love it! It’s very comfortable. Sometimes I even wash it when I get home so I have a clean one to wear the next day. Coolibar: Would you recommend this garment to a friend? JR: Heck yeah! I want all my friends to try it. Coolibar: Is sun protection important to you? JR: Yes, it’s Important for a healthy life. I think about sun protection, but probably not enough. Your clothing has changed my perception of sun protective clothing – Coolibar looks great and feels great. I wish more people knew about Coolibar and your products. 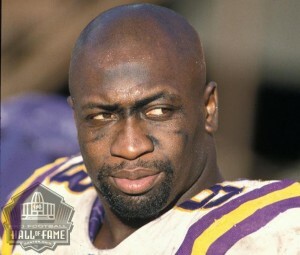 Thanks John for making Coolibar a part of your workouts. Our Cool Fitness Shirts for both men and women are 20% off, now through November 21, 2013. 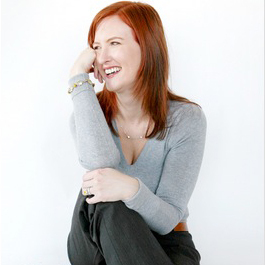 Since 2002, Style Expert Bridgette Raes has transformed wardrobes for hundreds of clients. She is president of the Bridgette Raes Style Group in New York and author of the book “Style Rx: Dressing the Body You Have to Create the Body You Want”. Bridgette is also Coolibar’s go-to stylist. Each week, she features one closet staple on her style blog and pairs it with five different outfits for her segment: One Item, Five Fashionable Ways. In honor of New York Fashion Week, we asked Bridgette to use her expert eye and style the Coolibar Vera Coastal Wrap. For this week’s One Item, Five Fashionable Ways, sun protection clothing company Coolibar asked me if I was interested in featuring one of their pieces for this post. 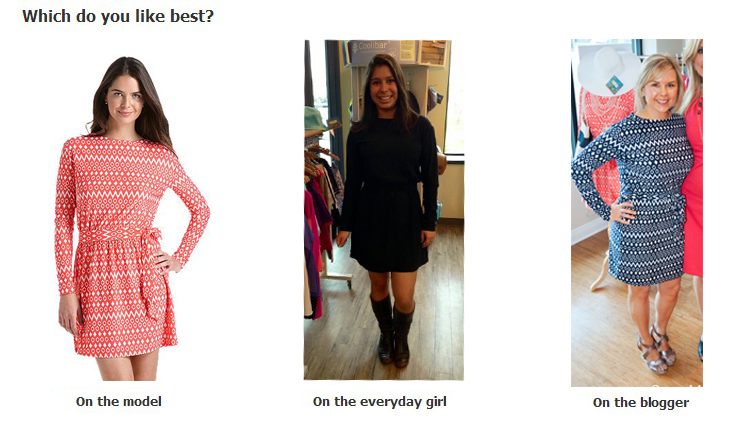 The choice was mine as to which item I would showcase and I instantly picked their Vera Coastal Wrap. I own this cardigan and love it because it is not just easy and figure flattering, but it is soft, SO soft, in their modal/spandex SUNTECT® fabric. I’m not kidding when I say it may be the softest, most comfortable fabric I have ever had on my body. Cardigans are no-brainer pieces that every wardrobe should have as functional outfit finishers. On a cool night they give you warmth. Feel shy showing your arms, they offer shy arms security and for a professional-work environment, they replace a jacket. When an outfit is based entirely in neutrals, like this cardigan look with khaki pants by Vince Camuto and a boat neck top by Modcloth, you have free range to bring in pops in any colors you like. Because it’s so trendy and popular at the moment, and because these colors go so well with taupe, I decided to go with pink and tangerine and chose these two-tone Sperry ballerinas and necklace by Stella & Dot. To complete the look, and for some sunny brightness, I chose an orange Fossil handbag and flowery studs also from Stella & Dot. If you’re are going to buy and wear colored casual pants this fall, investing in a neutral colored cardigan is a great idea as it will work with all of the colored bottoms you purchase. Here I chose to pair Coolibar’s cardigan with an eggplant pair of Boden skinny pants and layered an Anthropologie printed tank underneath. The look is finished with a versatile pair of grey rhinestone ballerinas by Sperry, a purple pair of statement earrings by Blu Bijoux and, for a third punch of color, a grey and yellow handbag from R+J Handbags to make the whole look casually colorblocked for fall. To bring your summer tanks into fall, a cardigan is a great choice. Plus, remember, all Coolibar clothing offers 50+ UVA and UVB sun protection. With their Vera Coastal Wrap you can give yourself some coverage while still wearing a flimsier top, like this one by Zara. Once Labor Day arrives, don’t assume that you don’t need sun protection. The sun is still shining and you should still be thinking about shielding yourself from the rays of the sun when necessary. This cardigan works well with a pair of jeans, like this boyfriend style by Levi’s. Pop the look with a bright shoe, like coral wedges by Seychelles, to pull in the colors of the print, along with Furla’s navy handbag and Privileged Gold coral earrings. A cardigan is a great way to bring a summer dress into fall or to layer some warmth at the office. This flattering print dress by Eliza J. has tones of the taupe right in the print, along with coral. Wanting to maximize all the items used in this post, I chose the same coral wedges and earrings from the previous look. The last component is an off white handbag by Melie Bianco. This cardigan is easy with a pair of camel pants, like these cotton trousers from Ann Taylor. I layered Modcloth’s pink top underneath and used the handbag and shoes from previous looks in this outfit as well. The outfit is finished with a Trina Turk disc necklace, Michael Kors studs and Cole Haan skinny metallic belt. Bridgette is hosting a shopping party to benefit the Melanoma Research Foundation, and you’re invited. Learn more. Shop the Coolibar UPF 50+ Vera Coastal Wrap. Just in time for Father’s Day, Christopher Lewis, the Dad of Divas Blog Founder, reviews Coolibar’s latest UPF 50+ fabric innovation created for men – ZnO pro. ZnO pro SUNTECT® blends cotton with a moisture-wicking polyester fiber to improve performance in hot, humid conditions where the propensity to sweat is high. 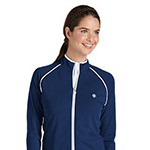 I was lucky enough to try out the new Coolibar ZnO Pro Quarter Zip Polo. I am always looking for clothes that look great but also protect. Especially after a fire that we had in my home in February and the ensuing hospitalization over Valentine’s Day, I have found that I have to cover my left arm and the skin that I burned even more than usual. With this being said it has become even more important for me to find clothes that give me that extra protection no matter what the weather and Coolibar clothing does just that. The shirt itself was so comfortable and it breathes making it comfortable to wear even on warmer days. I wore it the other day when it was in the mid-70’s and I did not feel overheated. The shirt does an amazing job at allowing the air to circulate while still protecting my skin. I have worn it a few times already, both in family outings as well as to dinner with friends. The shirt is more of a business casual shirt, but I feel comfortable in wearing it in casual situations as well. It looks good and trendy, while at the same time it goes with many different types of pants as well. I am impressed with how well this shirt has gone with everything that I have worn thus far. On top of this though is the UPF 50+ rating that will protect me from the harmful sun rays, which is exactly what I am looking for! All-in-all, if you are looking for a shirt that will not only protect you from the sun’s harmful rays, but is comfortable in the heat of the summer, this is definitely the shirt to pick up. On top of this, if you are looking for a lightweight shirt that is durable, the fabric used will definitely hold up for many years to come too! Guest blogger Christopher Lewis received free sun protective product for the purpose of this review. All opinions are his own.